E-governance or electronic governance may be defined as delivery of government services and information to the public using electronic means. The private partner brings in specialized IT skills and other resources. Outsourcing helps the government, generally lacking in the knowledge of current and emerging IT technologies, to make the right choice of technology. Project management skills in government are also quite poor and by outsourcing, services can be digitized with least penalty in time, cost and other resources. The private vendors would generally work more efficiently and effectively for faster development of projects at a lower cost. Day-to-day hassles of running, maintaining and managing the system can be left to the more specialized private partner. Outsourcing also allows mountains of inherent legacies of the government systems to be by-passed. Legacies reside in the organization, the hierarchy, the processes, the decision-making and in the people involved. Dozens of approvals required in the sanction of projects result in huge delays in implementation of projects and, finally, poor quality of service delivery. The choice of outsourcing makes it possible to jump over these legacy systems in one go, bringing relief to the government IT-administrators, who need not then be afraid of the auditors and their guillotines. The most important advantage of outsourcing lies in the fact that the government can concentrate on their core competencies. Productivity can thus be enhanced. Outsource to O2I and leverage the advantages of outsourcing. Geographic borders and time zones mean little for retail and manufacturing enterprises competing for mind share and market share in the global economy. With supply chains that span the globe, businesses are pushing to get their products to market and into the hands of their customers more quickly and more efficiently than ever before, little or no margin for error, they need experienced partners who can help them get the job done right, the first time. Major chains are expanding their presence across geographic regions and, in many cases, across national boundaries. Additionally, they are expanding into new markets that extend their brand to new product categories. Meanwhile, with the Internet has raised expectations for customer services. Customers are expecting retailers to deliver a consistent experience, regardless of whether they are inside the store, phoning a call center, or at their computer. Outsourcing these services proves both cost effective and leads to increased productivity. Outsource to O2I and benefit from expert, professional and skilled services that can tremendously increase your productivity. From drug discovery to selling, the pharmaceutical industry needs new solutions. Utilizing information technology efficiently is a critical component for business success and gaining the competitive edge. Outsourcing provides the small pharmaceutical company the ability to take new drugs through clinical trials by avoid the investment in infrastructure which would normally be necessary. After InfoTech firms, it's the turn of biotech and pharma companies to look at outsourcing from India. According to Proximare Inc, a consultant for pharma and related companies, over $200-million worth work is likely to be outsourced from India over the next 12 months in the field of biotechnology and pharmaceuticals. Outsource Research and Analysis services to Outsource2india and benefit from professional and expert pharmaceutical research services. The role of outsourcing in finance and accounting services is undergoing fundamental, industry-wide changes. Finance and accounting services providers and vendors of IT products and services to the financial sector have long used outsourcing to meet their limited tactical goals. Enterprises are relying on outsourcing as part of their broader strategic sourcing plans. Their goal is to improve competitiveness while reducing costs. A recent study conducted by The Economist Intelligence Unit shows that approximately 30 percent of the companies (in the study) outsource finance and accounting functions, with two-thirds of those (65 percent) characterizing the arrangement as successful (57 percent) or very successful (8 percent). While cost savings and increased productivity are key motivators for outsourcing, the study determined that finance and accounting outsourcing is increasingly being used as a catalyst for business transformation. Outsource finance and accounting services to Outsource2india and benefit from accurate, professional and error-free services that can give your organization a competitive edge. IT will provide healthcare organizations opportunities in 2004 to improve quality and reduce costs, while presenting challenges to the security and privacy of patient data. Healthcare's provider sector is opening its minds to the possibilities of business transformation through BPO. Rather than just focusing on the bottom line, they're realizing that savings from reduced operating costs can be redirected to investments in improving patient care quality, medical facilities or equipment and salaries. Outsource Healthcare BPO to O2I and opt for pharmaceutical outsourcing to avail the benefits of getting competent services at reduced costs, and at a faster turnaround time. Outsource2india offers a wide range of technology-driven and cost-effective services which include call center services, data entry services, engineering services, finance and accounting services, creative design, web analytics services, healthcare BPO, photo editing services, software development, research and analysis services and a host of other additional services. Outsource to O2I and experience an increase in your productivity, revenue and business value. 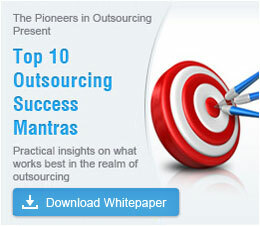 Along with these new areas in outsourcing there is also a shift in the reasons for outsourcing. Cost reduction is no longer the sole motivation as value addition with an improvement in productivity and quality is spurring people to explore India. The constantly growing BPO industry in the country is changing, incorporating new ideas and mindsets as well as opening up new possibilities for global companies. Outsource to O2I and benefit from our proficient services and fast turnaround time. Outsourcing to outsource2india can help you concentrate more on your core business functions, while we take care of your non-core functions. Your organization can also save on time, effort, manpower and infrastructure. Contact Outsource2india and get access to world-class services.